From what I understand of digital cameras, they are basically a lens plus a tiny two-dimensional array of millions of photo-diodes. And from what I understand of photo-diodes, they create a voltage when in the light, with higher-intensity light immediately causing a higher voltages. However, if this were all true, there would be no need for an exposure in digital cameras: the individual voltages could be read and (assuming our voltage-reader is sensitive enough and electrical noise is negligible) we'd get as accurate an image as possible almost instantly. But, this is not what happens. So where is my understanding incorrect? And are there any digital cameras that work this way? Sorry if this is a better fit for electronics.SE - but I felt like this question would be more interesting to this audience. I'm visiting from Electronics, so I'll add a little bit of electronics/semiconductor physics background to a couple of the answers you've already gotten. The key misunderstanding I think you have is that a photodiode doesn't create a voltage in response to light, it creates a current. Each photon that hits the photodiode generates a mobile electron inside the device (really an "electron-hole pair", but if you want that level of detail you'd better take the question over to EE.SE). Millions of electrons together constitute a measurable electrical current. Finally when this current is used to charge a capacitor, then you have a measurable voltage which can be sensed or recorded to form a pixel in your image. This is why, as cmason says, the sensor needs some time to fill each "bucket", and as mattdm says, it takes time for an accumulator to fill to the point it can be measured to form an image. Digital cameras attempt to do exactly that, it is only because of noise that they do not. Such as camera could be described as having an arbitrarily high ISO, and consequently correct exposure would be obtained with an arbitrarily short shutter speed. Making a low resolution large format back out of large photo diodes could be a fun project. I also think that in the future 'multi exposure' systems will be integrated into sensors- record the sensor values mid exposure but keep the shutter open, to get more detail in the blacks. Warren Mars's Photon Behavior site provides a table of the number of photons incident upon the pixels of various size under various lighting conditions for a 1/60th second exposure. Under 'living room light' this gives a value of about 110000 photons per pixel on a D7000. A red photon has about 1.6*10E-19 J of energy. It can be seen that the energy per pixel is on the order of 10E-14 J. A very small amount of energy to measure indeed. It should also be noted that fundamentally a zero second exposure camera is impossible, since it would allow no time for photons to hit the surface. Suppose we create a photon counting camera- that is one that can provide a 100% accurate zero noise count of the photons that hit each pixel. To get a 10 bit image the brightest pixels require that 1024 photons. In room lighting (Using the pixel pitch from the D7000) 2 million photons hit each pixel every second. Dividing the 2 million photons by the number of brightness levels (1024) we get a theoretical maximum frame rate of 1950 frames per second. 1/1950 would be the minimum possible exposure time for a 10bit image under room lighting. The brighter light immediately causes a higher voltage, but not hugely higher. That's the crucial part. If you want to have an image that looks like the eye expects it to, you either need to amplify the signal (increasing the differences between high and low, both correct and incorrect due to noise) or you need to read for longer, increasing the actual sample. The latter is what the sensors used in digital cameras do. 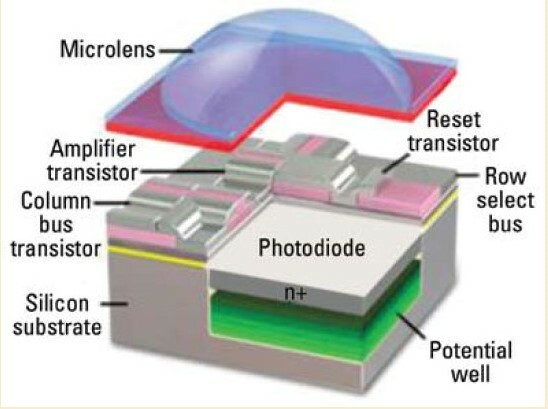 Each photosite is not just a light-sensitive photodiode, but also contains an accumulator called a "well". As the photodiode continues to produce voltage (as it is exposed to light), the accumulator fills. If the light hitting a particular site is bright, that well fills quickly. If the light is dim, it fills slowly. When the exposure is finished, the level of the well is sampled and converted to a digital value. Of course, in bright light, there's a lot of data, so a short exposure paints an accurate picture (if you'll pardon the turn of phrase). In low light, though, there's just not much energy to measured. If you just take a quick sampling, noise from reading the sensor and other unavoidable real-world randomness will indroduce variation as strong as the "legitimate" difference between the more full and more empty photosites, and there's no way to tell which is which. This is what happens when you take an underexposed image and try to crank up the amplification in software: noise, noise, noise, and maybe just blackness. And any instantaneous read (without an accumulator well) would not have enough data to be useful. Simple as that, really. Turns out that modern sensors are better at this than chemical-process film: it's why we can have seemingly insane ISO values of 25k and above. Those are able to measure finely enough that a large amount of amplification can be applied without noise becoming overwhelming. Fundamentally, though, compared to the magical instant-read device, we're still in the same ballpark. The simplest answer is that light is particle based, consisting of photons. A digital sensor is not a single photon trigger, but a bucket to be measured. I believe this is where you are confused: a sensor is not binary, nor are they sensitive to a single photon: a photon does not 'turn on' the sensor photo site. Instead, what is measured is how full the bucket is. Enough time must be given to properly fill the bucket, or no image will be recorded. Brighter scenes emit more and higher energy photons, thus filling the bucket quicker. Overfilling the bucket overexposes the image, losing detail or 'washing out' the image. To prevent this washing out, you simply shorten the time you collect photons. Not the answer you're looking for? Browse other questions tagged exposure digital or ask your own question. Why do cameras use a single exposure rather than integrating across many very quick reads? Why do digital cameras not have an iso rating? Why is my long exposure shot all white?